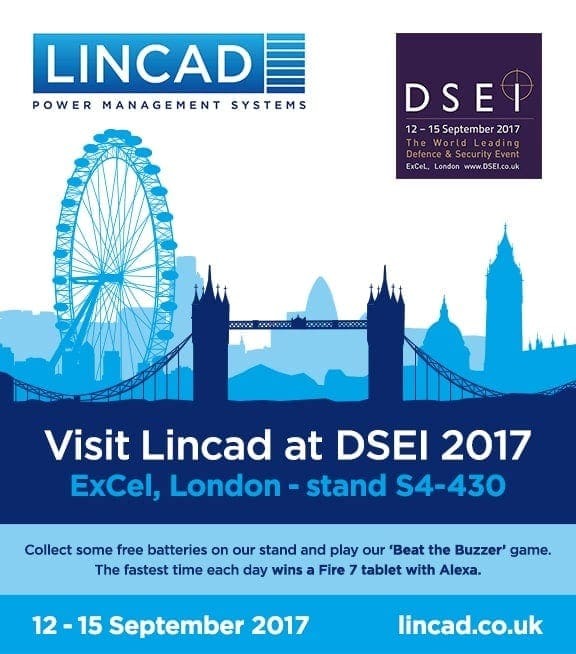 Lincad, the leading designer and manufacturer of specialist military batteries, chargers and power management systems, will be returning to the biannual DSEI exhibition, taking place this year between 12 and 15 September at ExCeL, London. Lincad’s stand (no. S4-430) is located in the exhibition’s UK Pavilion, alongside other British businesses and organisations that supply and work with the MoD and the major UK Defence Primes. Visitors to Lincad’s stand can watch a demonstration of its multi-chemistry Caravel Mk2 Charger, which charges batteries of any electrochemistry from any original equipment manufacturer, allowing an entire fleet of batteries to be managed from just one charger. Throughout each day of the exhibition, Lincad will be running a tough ‘Beat the Buzzer’ game on its stand, inviting visitors to prove their steady hand and be in with a daily chance of winning an Amazon Fire 7 tablet with Alexa. Stand visitors can also collect free batteries, as well as information packs about Lincad’s portfolio of specialist products. On the afternoon of the first day of the exhibition (12 September) Lincad will host a drinks reception on the stand for clients, contacts and colleagues. Company representatives will also meet with existing and prospective clients, including the MoD and international Defence Primes, as well as key industry influencers and global decision-makers. Lincad manufactures and supplies batteries, chargers and intelligent power management systems for military applications to military and defence customers around the world. Its main customers are the UK Ministry of Defence (MOD), UK Defence Primes and Strategic Military and Defence Partners. Lincad is also involved in developing new battery, charger and power management technologies for specialist applications across a range of different industries and sectors. DSEI is the world’s leading defence and security exhibition, taking place in London every other year year. It attracts more than 30,000 attendees and 1,500 exhibitors, including top international trade and military experts from across the global military and defence supply chains. The DSEI 2017 website can be found at www.dsei.co.uk.